effective immediately, 3:00 PM, 19 April 2019. Rainfall received in the past 24 hours and forecasted for the next 24 hour period in combination with rapid snowmelt of the remaining snowpack in the CVCA watershed has contributed to increasing water levels and flows at a faster rate than previously recorded this spring. The rainfall will continue to increase flows and levels as the water continues to be collected quickly in the tributaries of the Crowe River. Therefore, a FLOOD WARNING has been issued, EFFECTIVE IMMEDIATELY. Current upward trends are expected to continue for at least the next 24 to 48 hours. High levels and flows are being experienced throughout the watershed. Currently, areas currently experiencing flooding or the potential for serious flooding include 1) the Crowe River from Cordova Lake south through the Village of Marmora until the Crowe empties into the Trent River, 2) Beaver Creek in the Marmora area and 3) Paudash Lake, WOLLASTON LAKE, Chandos Lake, St. Ola (Limerick) Lake, Steenburg Lake, Cordova Lake, Belmont Lake and Crowe Lake. Municipalities, emergency services and individuals in flood prone areas should be prepared as these areas are especially at risk at this time for serious flooding. Increased flows and water levels on lakes, rivers and their tributaries are hazardous. Parents need to inform their children of these conditions. THEREFORE, THE CVCA URGES EVERYONE, ESPECIALLY CHILDREN TO STAY AWAY FROM ALL DAMS, WEIRS, HYDRO GENERATING PLANTS, BRIDGES. SPRINGTIME CONDITIONS ON WATERCOURSES CAN EASILY CREATE DANGEROUS SITUATIONS CAUSING HARM OR DROWNING ACCIDENTS LEADING TO FATALITIES. STAY AWAY FROM ICE COVERED SURFACES, DITCHES AND TRIBUTARIES – WATER FLOWS CONTINUE TO INCREASE RAPIDLY. CVCA staff will continue to monitor levels and flows daily and this Flood Warning will be updated SUNDAY APRIL 21st or as conditions warrant. If there are any questions or concerns, contact Tim Pidduck, CVCA General Manager or Neil McConkey, Water Resources Supervisor at 613-472-3137. The CVCA includes portions of the municipalities of Trent Hills, Stirling-Rawdon, Marmora and Lake, Havelock-Belmont-Methuen, North Kawartha, Wollaston, Limerick, Tudor and Cashel, Faraday and Highlands East. Spring is coming! Here is a very hopeful sign. Although many cottagers cannot get down their driveways yet because of there is still a lot of snow and the lake still covered With quite thick ice, these two swans stopped by on the shores of Wollaston Lake on Tuesday April 9th, possibly attracted by a little area of open water. The photo was taken by Beryl Lee on Kendon Lane. Beryl says that they have never seen the swans on the lake before in the spring as they migrate north to the tundra in the Arctic, but they have seen them for a few years now as they head south in the fall. The swans are thought to be Trumpeter or possibly Tundra swans. Hang in there. With the warmer weather the snow and ice on the cottage driveways will soon be melted and you will be able to return to the lake and and have your own wildlife sightings as you start on the spring chores. On March 4 council meeting, a motion to cancel the grant program that had helped to maintain cottage roads by reimbursing cottage road associations for material needed for upkeep of their cottage roads was passed. This was certainly a program that means a great deal to cottage road associations and helped to ensure that access to cottages was safe and passable. We encourage the council to rethink the change in policy and consider reinstating it in the future. Subject: A call to Wollaston Council to support long-term health of the Wollaston Lake environment. The anniversary of the March 9, 2018 bylaw amendment public hearing has just passed. There has been much activity since then, however, little has changed with respect to the concerns that the WLHCA executive and many of you expressed last year. The bylaw amendment was passed in June; a group of concerned property owners then successfully filed an appeal and a first consultation, in preparation for the hearing, is scheduled for the end of April 2019. · Our concern about apparent deterioration in the lake trout environment led us, in the Fall of 2017 to make a request to the Ministry of the Environment to participate in conducting detailed water quality and dissolved oxygen testing of Wollaston Lake in the 2018 season. Although they had no funding earmarked for this purpose, they believed our case was important and agreed to our proposal. Accordingly, in both July and September 2018, the MOE accompanied by the WLHCA Lake Steward completed detailed lake water quality testing. Results from these tests will be published in the spring of 2019. · In June 26, 2018, we brought a delegation to municipal council led by Barbara King, Executive Director of Watersheds Canada and attended by Leora Berman, Chief Operating Officer of The Land Between conservation organization. This delegation informed the previous Council about the role of municipal government in protecting the well-being of watersheds within their jurisdiction. A key role of townships (municipalities) is to ensure peer reviews of all study documents related to significant developments that could potentially impact the Wollaston Lake environment. · On July 14, 2018, we held a workshop on healthy shorelines, and Eurasian Milfoil removal. This was open to all, and for members of the WLHCA the workshop fee was funded by their annual membership and a grant from FOCA. All proceeds were donated to The Land Between. The purpose of the workshop was to inform lakefront property owners about their role in maintaining a healthy waterfront, and to educate all on what we can do to remove or reduce the spread of invasive milfoil. We applied for a grant from FOCA to purchase specialized rakes for milfoil removal, then loaned them to property owners and provided coaching on proper removal techniques. Our Lake Steward also engaged the MNR to support our milfoil removal efforts with a work party of MNR young rangers, in August, to clear milfoil from one of the shorelines. This site had previously been mapped by the FOCA consultant as a particularly large bed of the invasive milfoil; before clearing, we received the required approvals from the MNR and property owners. · We requested the (then-current) Council to attend our July workshop, and to commit to naturalizing the shoreline owned by the municipality at the public beach. We also requested they fund two subsequent years of the same level of detailed water quality testing the MOE had given us on a one-off basis in 2018, so we would have more longer-term detailed data. The former Reeve responded by attending the workshop and the former Council committed some funding for lake water quality testing, (with consideration in subsequent municipal budgets). Since then, the new Council, elected to represent all Wollaston Township stakeholders, has taken office and will soon introduce their first budget. It is the position of the WLHCA executive that Council should consider the well-being of Wollaston Lake before permitting or expanding any development within the proximity of the lake. We believe and “Best Practices” would confirm that a peer review of an Environmental Impact Statement (EIS) on any proposed development must be completed. This is necessary to detect any oversights of the study. A couple of examples of this would be, the required scope of the review (it needs to include the lake, not just the inland property), and storm water management plans. Neither of these were included in the previous EIS that supported the bylaw and bylaw amendment. It is also the position of the WLHCA executive that Council should call upon the review and consultation of the relevant Ontario (MOE, MNR, Crowe Valley) and federal agencies (Transport Canada, Fisheries and Oceans) experts to assess the “capacity” of Wollaston lake before consideration is given to applications for development affecting the lake or shoreline. Watersheds Canada and The Land Between are two additional valuable resources to consider consulting based on their broad experience with developments across Ontario and Canada. Good news for WLHCA: the WLHCA’s proposal for Wollaston Lake to be included in a new Blue Lakes project was accepted by the funder (The Land Between, with a Trillium grant). Blue Lakes is an Eco label pilot with the objective to provide a gold standard in lake stewardship excellence. Watch for the pilot to be launched in the spring of 2019 and ways that you can support the project. On Monday, PANCON, the company that had joined with Derek McBride, geologist and holder of mineral rights to a potential Nickel, Copper and Cobalt mining claim in Limerick Township, announced they were pulling out of the venture. The area is bounded by Highway 62, Old Hastings Road, Highway 620 and Steenburg Lake North Road. The area of the proposed mine shares waterways with many local lakes and shares a roadway, Old Hastings Road, between Wollaston Township and Limerick Township. While this is good news, McBride still retains the mineral rights in this area, and could still find other investors or exploration companies which want to try to pursue this. The group of neighbouring lakes continues to have their work ahead of them. We need to make it clear that mining should not be a consideration in this area. Keep up initiatives such as letter writing to government representatives and Ministry of Northern development and mines. I have attached an article by Nate Smelle of the Bancroft Times on the end of Pancon’s bid to mine in the Limerick area. In light of Limerick Township council's vocal opposition, and the lack of support for a mining operation in the area throughout the community. Limerick Area Conservation Coalition co-founder Monica Nikopoulos said she is pleased to see that Pancon listened to the community. Nikopoulos expressed her gratitude to all who stepped up and worked to defend the natural beauty and ecological integrity of the land and water that makes the Limerick area a premier destination for cottagers and tourists. She said the fight would still be going on if it weren't for Chief James Marsden and the Alderville First Nation, Mining Watch Canada, everyone from the lake associations and the hundreds of permanent and seasonal residents from Limerick and the surrounding communities that united to protect the local environment and economy. Looking forward, Nikopoulos said although Pancon's decision to pull out of the McBride project has given the community reason to celebrate, the fight to keep mining operations out of the area is not over. “While Pancon's termination of the McBride Project is wonderful short-term news, we still face the ongoing challenge of Hastings Highlands Resources potentially searching for another investor to continue explorations now and in the future,” said Nikopoulos. The Federation of Ontario Cottagers (FOCA) Annual Meeting on March 2,2019, WLHCA was represented by two WLHCA members, Fred McConnnell and Sheila Currie. FOCA provides valuable information, research and support for cottaging and we were indeed fortunate to have Fred and Sheila devote a day to attend on our behalf. A task force of a group of the local area lake associations which include Limerick Waterways Ratepayers Association, Tri-Lakes Conservation Group, Shawano Ratepayers Incorporated, Thanet Lake Cottagers Association, Wollaston Lake Home and Cottagers Association, and Steenburg Lake Community Association, led by Pat Stallaert, President of Steenburg Lake Association addressed the Limerick Council on Monday, March 18th, at the Limerick Community Centre. The goal was to present arguments and concerns to the Limerick Council outlining the opposition to the mine by the local lake associations. It was hoped that Pat Stallaert’s presentation would persuade the Limerick Council to draft a resolution to voice Limerick’s opposition to the mine to the Ministry of Energy Northern Development and Mines. To assist the Limerick Council to create a resolution, a version of a draft resolution was developed by Pat Stallaert assisted by the group of local Lakes. Pat’s presentation was successful and was well received by Limerick Council. The council adopted and edited the wording of the resolution to reflect the needs of Limerick Township. They passed a resolution in Council to reflect their opposition to a mine in Limerick Township. Christine Drost of Bancroft Times attended the meeting and will report in next week’s paper. Representatives from local lakes (Tri-Lakes, LWRA, and SLCA) were there to support the presentation. It's time once again to call upon the community to help bring awareness of opposition about the McBride Project mine in Limerick Twp to the attention of the government bodies that regulate it. The mining Exploration Plan registered with Ministry of Energy, Northern Development Mines (MNDM) by geologist Mr. Derek McBride expires May 6, 2019. A press release regarding this will also be articled in the Bancroft papers. LACC (Limerick Area Conservation Coalition) is appealing to the public to write and/or email MNDM stating your concerns in opposition regarding any further mining explorations to be received at MNDM by the deadline of April 8, 2019. Majority of the community are vehemently opposed to any mine undertakings at this site. Strong community appeals to MNDM could effectively terminate any further mining activities on this site thereby preventing the irreversible environmental devastation. Kindly write and/or email MNDM stating your concerns in opposition to all mining explorations and activities regarding the McBride Project. To date, MNDM has been very insightful and approachable and have responded timely. Please ensure correspondence is considerate, respectful and factual. One hand written letter is equivalent to 1000 emails. Please note that LACC is not against mining as it provides a necessary resource. LACC is opposed to this location because of the negative wide spread environmental and socioeconomic impacts of this mine. WLHCA has been very proud of our association with The Land Between and being part of their Blue Lakes project. They have just posted information about upcoming plans and directions. It is gratifying to see such valuable work to promote the environment. Two articles have recently been posted in local newspapers that you may want to read. The first is about a police investigation of the municipal election in Wollaston last fall. In the Belleville Intelligencer. The second is regarding two of Wollaston Staff who have given exemplary service to Wollaston Township resigning unexpectedly. If you want to respond to WLHCA about the articles you can contact us at WLHCA.news@gmail.com. October’s municipal election in a township south of Bancroft is now the subject of a police fraud investigation, The Intelligencer has learned. The Oct. 22 election in Wollaston Township resulted in an almost total change of the local council and an ongoing controversy. The rural township, which includes the hamlet of Coe Hill, lies just west of Highway 62. Concerns range from questions about voter eligibility to allegations of improper handling of ballots. Police confirmed in October they’d begun gathering information and on Tuesday said a formal case is now open. “There is a fraud investigation ongoing at this time,” Bancroft OPP Const. Phil Regamey told The Intelligencer Tuesday afternoon. No charges had been laid as of Tuesday, said Regamey. Several detectives of the Madoc-based Central Hastings OPP crime unit are handling the case, he said. The date at which it became a fraud investigation wasn’t immediately available Tuesday. Regamey said it’s not known when it could end. Regamey said police investigations of elections do not occur “very often” and he was unaware of any other investigations of local elections in recent memory. He said major cases would be investigated by the OPP anti-rackets branch but the branch was not currently involved in the Wollaston case. Rachel Widakdo, a spokesperson for Ontario’s Ministry of Municipal Affairs and Housing, wrote in a Nov. 1 e-mail that courts, not the ministry, enforce the Municipal Elections Act. “The Ministry of Municipal Affairs and Housing does not have a role in investigating elections or in determining penalties,” Widakdo wrote. “Under the Municipal Elections Act, municipal clerks are responsible for determining the results of the election and making this information available as soon as possible after voting day,” she wrote. “Questions or concerns regarding a local election should be directed to the municipal clerk. “If an individual wishes to seek legal advice on options for further action, they should speak with a lawyer,” Widakdo added. The role of acting returning officer on election night fell to township administrator Dylinna Brock. “There was nothing unusual” about the township’s election process, Brock said Oct. 30. When contacted Tuesday about the police investigation, she said she had no comment. Barb Shaw received 657 votes to defeat incumbent reeve Graham Blair, who received 583. Michael Fuerth placed third with 220. Shaw said Tuesday she had contacted Bancroft OPP prior to election day about one issue. “My concern specifically related to last-minute additions to the voters list,” she said. “Leases were signed toward the end of the campaign. That then added people to the voters’ list. Those people then cast ballots,” Shaw said. “This was a very concerning situation that I noticed before election day and I did what I thought was the responsible thing to do, which was to bring it to the attention of people who could determine if this was an issue” and follow up as needed, she said. The OPP’s Regamey confirmed Shaw’s complaint led at least in part to the investigation. “That’s why it was looked into and then the crime unit decided to open an investigation into it,” he said. Regamey added it was unclear how many election-related complaints police had received; some callers had called regarding issues unrelated to the investigation, he said. Graham Blair, who after 15 years in municipal politics was unseated by Shaw, said a fraud investigation wasn’t surprising. “I know that there was definitely some unease in the municipality about voters who perhaps weren’t perhaps properly qualified to be voting,” he said Tuesday. “Approximately 26 per cent of the voters in Wollaston Township were campers,” Blair said, referring to about 700 voters whom he said owned units at two seasonal campgrounds. One campsite had five voters, he said. “My feeling is that we have a council that is really not representative of the community. “I’m in the process of writing a letter to Municipal Affairs to see if I can get some clarity on how exactly qualified voters are monitored. That’s a concern, politics aside,” said Blair. “My understanding is that the onus is on the voter to ensure that they’re qualified to vote,” he said. He compared it to motorists being “expected to write ourselves parking tickets” after their time on parking meters expires. Township treasurer Verna Brundage had served as both acting clerk and acting returning officer. “It seemed that there were some unethical things that happened. And whether they’re unethical or illegal, I don’t know,” she said in October. But she would not explain and placed the onus for addressing those things upon the people involved. She did not name anyone. Brock said the departures of Brundage and clerk Jennifer Cohen, who is currently on maternity leave, were unrelated to the election. Cohen could not be reached Tuesday for comment. Reeve Shaw said members of council are focusing on their work, not the investigation. “It’s not preventing us from getting work done,” she said. But because of the election unrest, “We realize how fragile our institutions are. “The OPP have been respectful and professional,” said Shaw. Anyone with information about the case is asked to call police at 1-888-310-1122 or Crime Stoppers at 1-800-222-TIPS (8477). It has come to our attention that the following document was mailed by the Wollaston Township from the new council. Most taxpayers with mailboxes in Coe Hill received a copy. As it seems that some owners of seasonal lake property would not receive a copy, we are trying to contact as many of you as possible so you will be able to consider the information in the document. The communication outlines ways to participate in 6 committees that consider issues important to Coe Hill and how to provide input to the new council. If you want to be considered for one of the committees you must apply by January 10th. This notification will be posted on our facebook page & sent to our members by email. The document is also posted on the Wollaston township Website under “home”, from the Home page, click on the “News and Announcements” button. Once on the news page, scroll down until you see the letter. We have also provided a copy of the letter below. The New Library Board has been voted in by the new council. Congratulations to Peter Lennox, Gail Dugas, Roxanne Lambert, Wendy Mortimer, and Sarah Haas who have been appointed to the next term. We wish them well as they build on the solid footing established by the previous board. The June 12, 2018 Wollaston Township Meeting includes a delegate from Landmark Associates Limited to speak to Wollaston Council re: Bear Ridge Campground Application to Amend Zoning By-Law and Site Plan. The letter from Landmark Associates to Reeve Blair & Members of Council can be found by following this link. The 2017 report on the water quality of Wollaston Lake is now available. 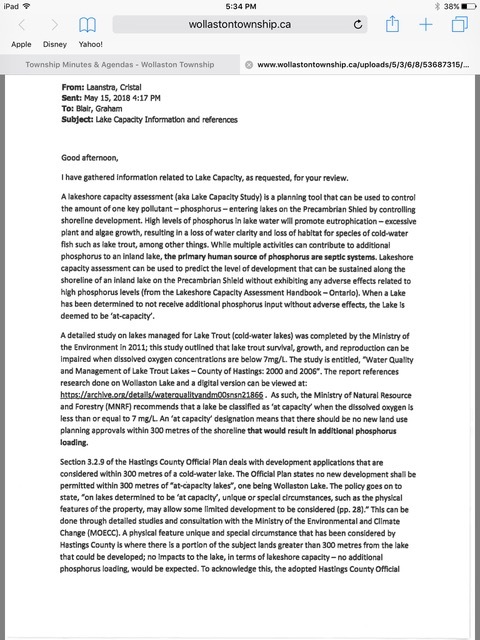 Along with this report, 3 documents on Lake Capacity have been provided. We feel these reports contain important information for our members to understand the current state of Wollaston Lake. 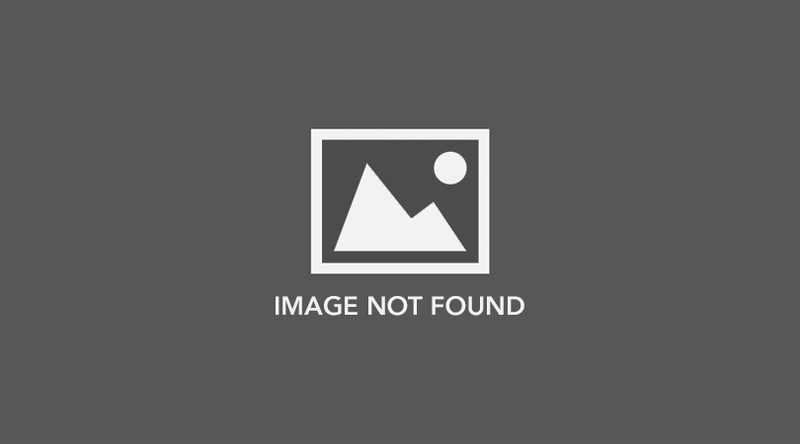 Please click on the report titles to open the corresponding report. The 2017 Invasive Species Watch Report from the Ontario Federation of Anglers & Hunters has been posted on the Invasive Species page in the Environment section of our website. You can follow this link to the report.